Every Sunday night, Winter and Summer, a Whist Drive is held in Myshall Community Centre. At the beginning of 1961, Fr. Joseph Keogh P.P., together with Dr. Martin Burke C.C, started the whist drives as a social and fundraising venture for the Parish. 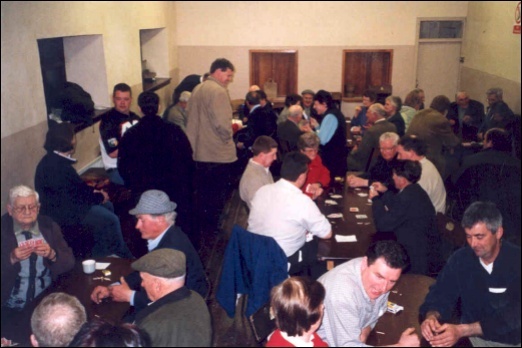 With ten station areas in the Parish, each area in turn sponsored a whist and was responsible for its running and catering on their designated night. There was a tremendous response from players and sponsors alike and an average of twenty tables (80 players) was then the norm. In 1968, Fr. John Hayden, then P.P. of Myshall, continued with the whist and this situation prevailed for about forty years. With time, the players became fewer and the sponsors lost interest. Today the whist is run by a committee. The average weekly attendance is now eight tables (32 people), most of whom come from neighbouring towns and villages. Proceeds from the whist are donated toward the upkeep of the Community Centre, and we are delighted to be able to help out here in any way we can.